Many parents who have spent their lives caring for a son or daughter with specific physical or emotional needs know they could face a daunting scenario in the future. They know that their own ill health or general old age may eventually prevent them from doing the job of a carer every day. The inevitable consequence is the person needing care must receive it elsewhere which means them moving permanently into a care home. Kevin Lloyd and his family from Ellesmere Port went through this 13 years ago when his autistic brother Gareth moved out of the family home for the first time at the age of 39. He had lived there with his dad all of his adult life, after his mum died when Gareth was 23. Gareth and his dad had a really good relationship but it had become strained. Gareth’s dad was 83 and could no longer give him the attention and support he needed. 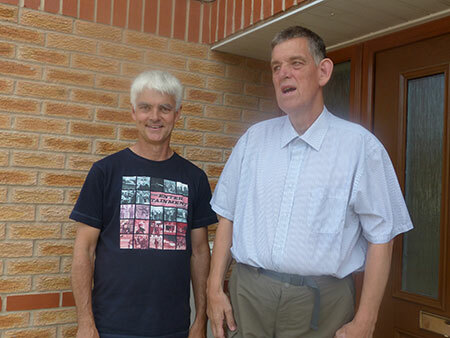 Gareth, who is now 52, moved into a supported living facility in Dover Drive, Ellesmere Port. It is run by Vivo Care Choices, which is funded by Cheshire West and Chester Council. Gareth was one of the first residents at the facility when he moved in. Kevin said: “When the day came to move we were just as concerned for my dad because he was 83 and this was going to be a major impact on his life as well. Gareth took to this place like a duck to water, he just loved it from day one. There were no phone calls to say he wants to come home. When we came to visit he was as happy as Larry. “We all felt Dover Drive was the ideal place, for a whole host of reasons. The geography of the actual buildings is good, there is an outside area and it is on the edge of a housing estate. Gareth has got his own domain out there, which is slightly detached from local residents. Vivo enables Gareth to live his life as independently as possible and respect the choices that he makes. He loves the countryside and, with Gareth having access to a car, staff are able to take him on trips into the country so he can enjoy his love of animals. Vivo supports people with autism, dementia, learning disabilities, older people and those with profound intellectual multiple disabilities in various day care settings across the borough. Cllr Paul Dolan, Cabinet Member for Adult Social Care, said: “The services provided by the Council’s partner Vivo enhances individuals’ life opportunities by developing their skills in work, volunteering and social engagement. Gareth is part of a community of people with autism who live in Dover Drive and their family members have also formed a community. Kevin said: “There are carers meetings here every two months where we get together and discuss issues that need to be raised. This is great because it is those that work here being made accountable to us. If there are any concerns or suggestions that we have we can put it to them. Communication is so important and the managers here recognise that as well.